Read the Nieman Foundation’s announcement for details about the future of the Nieman Watchdog project. It has been my pleasure to be editor of Nieman Watchdog but all things come to an end and this is a goodbye column. We went online in 2004. About 350 writers, many of them leaders in their fields, have taken part, almost all sharing the same goal: to encourage the press to do better reporting on public policy issues. There’s plenty of work toward that end that needs to be done. Important issues are neglected, editing is sloppy, the daily report is thinner, etc., etc. There just isn’t enough good journalism, and there is too much forfeiting when it comes to seeking out important news. War coverage is a dismal case in point. As John Hanrahan wrote on this site, at any given time only handfuls of American reporters have covered the news from Afghanistan these last 11 years; as Sig Christenson reported in 2007, aside from the big, elite media only three regional news organizations consistently sent reporting teams to Iraq during the war there. Imagine: two terrible, lengthy wars with hardly any coverage. In surveys we did, Nieman Fellows around the world lambasted the American press – gave it a grade of D – for its coverage of the run-up to the Iraq war, and implored American reporters to get out of their “he said, she said” political mode, a lament that still applies. As a group, the traditional U.S. press has badly failed at reporting dissent in America – there’s abundant newsworthy protest but you can seldom tell it from the news media – and has failed at reporting on poverty, failed at follow-up reporting on the Bush administration torture policies and other actions, and failed to sufficiently report the Obama administration’s high-handed refusal to deal with those issues. Instead of ridiculing the obstructionist Republican party leadership in Washington and the states, as it should, the mainstream press treats them as if they have goals other than serving large corporations and the rich and suppressing the vote. Not to defend Democrats, but if the press did decent, steady reporting on politics, made fun of GOP fantasies, and if the Democrats behaved, as Paul Wellstone once put it, more like the “Democratic wing of the Democratic party,” then it would be hard to imagine more than a few Republicans winning national office. The press ignores climate change, a world crisis, for weeks at a time. Corporate influence on America and the remnants of a labor movement are seldom reported on at all. Not all the news about journalism is bad. Day after day the New York Times is giving people their dollar’s worth with imaginative stories, a varied editorial page and solid investigations. At times The New Yorker, the New York Review of Books, McClatchy, Rolling Stone magazine, and writers at the Washington Post do brilliant, independent reporting and commentary. Warren Buffett, promisingly, has bought dozens of regional and small town papers where, one thinks, things can only get better. An online group, the Investigative News Network, begun in 2009, now includes 60 news organizations and seems to have taken root. Newsrooms are popping up at universities such as American University where Charles Lewis runs the Investigative Reporting Workshop. ProPublica, the Center for Public Integrity and the Center for Investigative Reporting are doing important stories that run prominently on TV and on the front pages at major newspapers. And for people of all tastes, there is Huffington Post, the media cornucopia. I saw it as the role of NiemanWatchdog to press for better reporting, and I’d like to single out a few contributors in particular who helped do that. One was the late Lt. General William Odom, a cold war hawk, National Security Agency director under Ronald Reagan, historian, intellectual, author of seven books, a political science teacher at Yale – and an early, outspoken opponent of the Iraq war who began taking part in NiemanWatchdog in 2005 when, he told us, op-ed pages rejected everything he submitted. Odom’s first piece was titled “What’s wrong with cutting and running?” Its premise was that every stated reason to stay in Iraq was really a reason to get out. 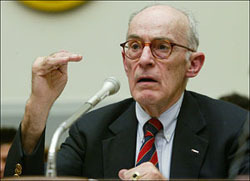 Odom did occasional pieces for us afterward and they were noted widely enough so that cable TV and talk radio called on him frequently; he was asked to testify at Congressional hearings and the Washington Post devoted more than half an Outlook section front page to an article of his titled “Victory is not an option.” Odom believed Nieman Watchdog was a key to his return to the limelight. If so, it shows the vitality and power of the Internet – a few articles on a not very widely known website brought Odom back, from being shunned to being very much sought after. Then there is Henry Banta, a renaissance man posing as a D.C. lawyer. Hank has written about 50 pieces for Nieman Watchdog. His specialty is making complicated economic ideas clear enough so that even reporters can understand them, but he can tackle any subject. Reporters and editors would do well to look up Bruce Kushnick on our site; they’ll find years of stories including very recent ones, all relevant and begging to be followed up, on the failure of the FCC to regulate the telecoms (instead Verizon, ATT and the telecoms in general are regulating the FCC). Other contributors of note include Judith Stein on health care reform and Medicare; Judith Bell on poverty; Gilbert Cranberg and Herb Strentz on explaining Iowa and other meritorious efforts; Diane Ravitch, Bill Claiborne, Martin Lobel, Jerome Starkey, Philip Coyle, Steven Kleinman, Linda Bilmes, William Astore, Philip Meyer, Chas Freeman, Mary Curtis, Myra MacPherson, John Hanrahan, Karen Greenberg, and many others. The Nieman Watchdog site was funded by Murrey Marder’s donation to the Nieman Foundation. My colleague, Dan Froomkin, and I have edited it with Murrey’s “wake up angry” stricture in mind. Realistically, it is Dan’s site as much as mine; he got Odom and many others to take part. We have been assisted by a capable researcher, Nonna Gorilovskaya. Helping shape the thinking from the beginning, with Murrey, were the distinguished longtime Washington Post investigative reporter Morton Mintz, who served as senior adviser and contributor, and former Nieman Foundation curator Bob Giles. Giles saw to it that the site got off the ground and offered encouragement and smart editing and other advice until his retirement in 2011. Also, no technical glitch or serious problem has been too tough or weird for the creative, always available Fabio Silva. My thanks go to those who have written for Nieman Watchdog, to the thousands who subscribe to our email updates and also to more casual readers. Keep the pressure on.